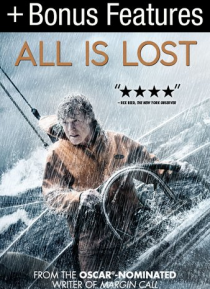 Robert Redford stars in an open-water thriller about one man's battle for survival against the elements. Using a sextant and nautical maps to chart his progress, a lone sailor is forced to rely on his survival skills and ingenuity when his sailboat is damaged at sea. But with the sun unrelenting, sharks circling and supplies dwindling, the ever-resourceful man soon finds himself staring mortality … in the face. Includes bonus features.